It's easy to visualise a good picture in your mind, the tricky bit is actually painting it. We all daydream, recreate scenes in our imagination; see movement, even invent sounds and smells and for those of us fascinated by aeroplanes, we are able to transport ourselves back to long-lost airfields and vanished skies. Reality soon jolts us back to the present-day with some pressing chore or traffic lights turning green but, while it lasts, it can be a harmless and happy escape. In the mind of an artist, daydreaming is a part of the job, it's where paintings are born. Representational painting has been around since prehistoric times. With Spitfires being even rarer then than they are now, the subject was more likely a deer or mammoth and their canvas the wall of a cave, but the illusion of presenting a 3D world in just two dimensions was a great fascination that never went out of fashion and which, thankfully, still remains popular today. For artists it provides an endless challenge to capture a moment in time with realism, vibrancy and artistic worth. It's endless because it's impossible, you never quite achieve your goal and you never stop learning; that's what makes it such a pleasure. But painting is not just an indulgence for the artist. For aviation enthusiasts, and indeed anyone with an interest in history, paintings can be valuable windows on the past, depicting scenes in full colour that were never recorded by any other means. In the aviation world particularly, the artwork and limited edition prints of aircraft have often been adorned by the signatures of aircrew from the actions depicted and so become a physical link with history. Once you have the nerve (or audacity) to call yourself an artist people expect you to be good at it, not just once but again and again. But some pictures are less successful than others. In an attempt to keep my work fresh I have to take risks by attempting some new direction or something more artistically daring. It doesn't always pay off and, as an artist is only deemed as good as his or her latest painting, there is never an opportunity to rest on your laurels. Because the paintings have to be historically accurate it's often the case that artistic qualities of a picture are compromised. For instance, it's frustrating how many significant events from aviation history happened on dull days and over dead flat scenery! I look for a splash of red or yellow in a scene to liven it up but then find that the particular aeroplane I am depicting was the most colourless in the whole squadron. Twenty years ago many pieces of aviation art were of generic scenes with no specific squadron, place or date mentioned but now the market demands realism, actual dates and places and even the right weather and time of day. I have a bit of a reputation for scenery in my pictures. In fact, where possible, my rule is that if you were to take the planes out of the scene you'd still be left with a pleasing landscape. Half the appeal of my job comes from painting the scenery even though it adds greatly to the time a picture takes to complete. As well as the rivets on the aircraft I also need to research the scenery to make sure I have the correct chimney pots and stonework on cottages, trains in railway yards or tractors in fields; and should that wisteria on the wall of an English pub be flowering in June? I didn't realise that there were so many types of palm tree or dugout canoe...all important stuff when painting a south west Pacific island. It's all most interesting and I become absorbed in the detail of these constructed places and times. Occasionally the attention to the backgrounds pays even bigger dividends. Brian Kingcome of 92 Squadron ignored the Spitfires in my painting 'September Victory' and pointed at the landscape saying ''That was the Britain we were fighting for''. It meant so much to me. For a while during the Battle of Britain he flew from the very airfield where our home now stands and where I'm typing this. I have a photograph of him, taken in July 1940, lying with his fellow pilots and a faithful dog in front of a Brian's aircraft. Today it's a farmer's field, the Spitfires long gone and so, sadly, is Brian but, at least in this corner of Gloucestershire, the Britain he fought for still remains looking much as it did then. I feel very fortunate that I am one of a number of artists making a full time living by painting aeroplanes however, beyond my studio window and the overgrown perimeter track of 'our' airfield, the world of visual art moves on apace. These days many commercial artists and illustrators never touch a paintbrush and, instead, their computers are capable of not just painting pictures but animating them too. I sometimes wonder what the future will hold. Perhaps if I were a young art student now I'd be looking to these new technologies but, being the wrong side of fifty, I think it's best for me to stick to the old methods. For those interested in the 'low tech' methods of my picture painting here is a brief account of how a recent one was made. The painting I have chosen for this feature is 'The Mighty 100th', on the face of it not a complex image but nevertheless a tricky balance of mood and composition. 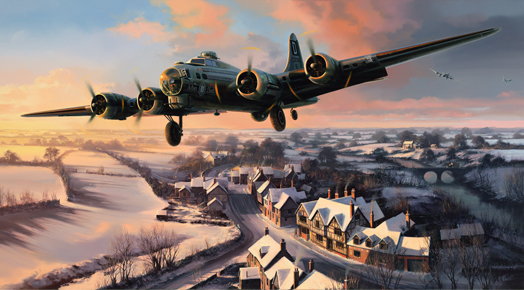 It depicts a gentle Christmas card England below and the noisy, aluminium beauty of a Flying Fortress looming large in the foreground. It's a combination that fascinates me; the contrast between what were state-of-the-art war machines returning from the heat of battle and, below, the tranquillity of the English countryside. It's a theme I keep returning to because many of the apparently timeless landscapes of the 1940's were to change greatly in post war years and are as much a source of nostalgia now as the aeroplanes themselves. There are the small fields, an ancient hamlet untainted by modern development, and narrow roads mercifully free of cars. In this picture I resisted the temptation to include a train because I've done it often before although, in truth, if you flew across Britain in those days you wouldn't get far before seeing a tell-tail plume of white steam.. So the design for this new painting started as an image in my mind or, perhaps, more like a short sequence of film footage complete with movement and noise and a sense of bitter cold as the winter sun sinks over the snow-blanketed fields. And of course there are also thoughts of the crew aboard 'Silver Dollar', safely home again after who knows what ordeal. How would this aircraft's charmed life end? Would the crew be looking forward to the fireplace at the 'Swan' and a pint of good, if slightly warm for American tastes, ale? The balance between landscape and aircraft and the shallow space available on this canvas called for a very specific angle for the B17. I photographed models and searched through books but it wasn't until finding a small and rather blurred photo in a magazine that I had the perfect angle. I blew this up on my photocopier and made a pencil trace, filling in missing details by studying other photos. The painted image of the B17 would be large, 37 inches from wing tip to wing tip. As for the landscape another happy discovery helped me. We were exploring Warwick Castle on a family birthday visit and from high on the battlements the view of the old town of Warwick gave me a street of shapely buildings ideal for my composition. They wouldn't be recognised as I eventually painted them because I reconstructed their architecture to look more in keeping with that of East Anglia where the 100th Bomb Group was based. It wasn't the buildings of Warwick I needed, it was their perspective and position in a landscape sloping towards a river. With this as a perspective framework I could then confidently construct my Suffolk village. Now all I needed to do was get my design approved by Neil Ellis-Smith the kind collector who had commissioned it. Fortunately for me he is one of those collectors who believes in giving artists freedom so that they are more likely to come up with something good (a brave man indeed). I like to stretch the canvas myself not only to save money but also so I feel more connected to the painting. It's a very fine-grained, ready-primed white surface ideal for detailed painting and is stretched on stout wooden stretchers measuring 40 inches by 22 inches. I transferred my pencil design to the canvas by tracing, using a product similar to old fashioned carbon paper but designed for artists and which leaves only a fine grey line. Now came the exciting time, squeezing out the paint and making a start. I like to use as few colours as possible, not because paint is expensive but rather because I prefer to mix the exact colour I need from just some of the colours of the spectrum. It takes a while to get the feel for the particular 'palette' of a painting, that limited range of colours that gives an individual painting its character, but it's worth the effort and lends every picture a uniformity which would be hard to achieve if I simply reached for a different tube of paint every time I needed a slightly different colour. I like green, for instance, but haven't owned a tube of green paint for twenty years now and can't imagine why I ever would when it's so easy mixing yellow and blue together. Having spoken with many other artists I seem to have an odd approach to painting. Instead of building the whole scene up as layers of paint, gradually pulling into focus the various elements, I have a far more deliberate tactic. I begin with the main aircraft, either the nose or the national insignia and work until the plane is up to a fairly completed level while the rest of the picture is a plain white background. The advantage is that I can rest my hand on clean dry canvas and control the brush more effectively to paint the accurate shapes, edges and details. It's also a very rapid way of painting and I'm sure this dates back to when I was a commercial illustrator and deadlines were always tight. The disadvantage is that without all the background being in place I have to predict how the colours of the surrounding sky and landscape will effect the colours of the aircraft. But this is where forward planning comes into play. Before I begin painting I will have already collected photographs showing just the sort of landscape and lighting I want to portray and armed with these it's easier to visualise how my main subject will be effected by the surrounding colours. Although I get excited about the main subject in the scene I am just as motivated by lighting, colour and mood. So, before I make the first brush stroke, I have a very good idea of the specific range of colours which will be used. The accompanying photographs show the day by day progress of the Fortress painting and how I approached each part of the picture separately and yet always in the back of my mind was the finished concept. Working from top to bottom reduced the ever-present danger of smudging sections completed the day before. It's invariably the case that if I do accidentally smudge earlier work it's always a bit that I'd been pleased with! I like to pay particular attention to the critical area where the sky meets the distant landscape. Regardless of what scenery is depicted, or where in the world it might be, distant skies have a very close relationship with the horizon and so I carefully marry those two areas together before progressing to the rather more forgiving areas of the nearer landscape. The exact arrangement of features in the foreground of the landscape are rather less fixed than any other parts of the picture. There is the opportunity here to move things about or adjust their size and lighting to suit the balance of the picture. That is why you will see how, with the exception of the inn, which was quite detailed from early on, the buildings, trees and fields in the foreground were established with generally less precision until I was happy with the effect they were having in the design. Only later did I add the details. These final details are best done when everything underneath is bone dry and, although not much paint is involved, they make the world of difference, really bringing the picture to life. The sharpest and brightest highlights are reserved for the main subject often, as in this case, the aeroplane and it helps to give it the magical 3D effect I strive for. Sable brushes that are really intended for watercolour painting are ideal for my style of oil painting. They are the small pointed type, number 2, 1, 0 and even 00 and although their points wear out rather quickly on the abrasive surface of the canvas the blunted brushes can be 'demoted' for less precise work. For skies and broad areas of landscape I use flat brushes, 1/4in through to 1in wide. For softening the edges of clouds, smoke, mist or propellers I use even wider flat brushes although these are the cheaper ones made with synthetic hair. They are used 'dry', not loaded with paint but simply to gently brush over recently painted areas, 'feathering' or blending to create subtle effects. I like Winsor and Newton Artists' oil paint if only because it's all I've ever known and always does what it promises. I'm sure some other makes are equally as good. With most oil paint, the dark colours can dry with a rather matt finish so I use Artists' Retouching Varnish to restore the glossy lustre. This is essential when matching new paint with that which has already dried. Paints take varying times to dry depending on the colour, thickness and time of year. Sometimes it's necessary to leave a picture for days, getting on with other projects until it's safe to continue. Paint dries most quickly in summer but usually not before some unidentified flying insect has practised circuits and bumps on it. As a picture nears completion I photograph it and then using Photoshop on my computer I experiment with the positioning of the smaller but important features such as distant aircraft, items in the landscape like vehicles or, in the sky, smoke and flak bursts. These can all be experimented with digitally without risking messing up the real painting. Once I make up my mind about what to do these final elements can be added with confidence. Photoshop also allows me to flip the picture horizontally, creating a mirror image, so I can see the design with fresh eyes. It's amazing how any mistakes suddenly seem so obvious and, best of all, there might be a pleasant surprise as I see the positive aspects of the picture for the first time. When the picture is finally finished and ready to be professionally photographed for print a final application of retouching varnish brings all the colours and tones to life. Oil paintings take at least six months to dry thoroughly and only after this period may they be given their proper finishing coat of varnish. This is designed to last a lifetime without yellowing or crazing like some old pictures you see. Thank goodness for modern materials. Every new canvas is both intimidating and exciting and it's the same feeling I remember having when I first started painting as a child. Perhaps it's a bit like being a singer, always having to prove yourself with every performance but at least I don't paint in front of an audience and have the luxury of hiding my errors before anyone gets to see them, in the attic...or if they're really bad, the local rubbish tip. I have never known a picture turn out exactly the way I imagined it. In the early stage I feel in control but as the picture takes shape what was planned and what actually looks good on the canvas differ so that as the days go by the picture takes on it's own character. I've been doing this long enough now to avoid the worst pitfalls so although I might encounter problems I keep going until I win the battle. Often, the troublesome paintings turn out the best and they are the ones that teach you the most. You really do never stop learning and that's what keeps it interesting. A large canvas like this takes about four working weeks to complete although that is just the painting and doesn't include all the preparatory work, designing the composition and researching the event and aircraft portrayed. In this latter area I am so fortunate to have the generous help of friends who spend huge amounts of time in order to ensure that the research is accurate. Nick Maue, who is a walking encyclopaedia when it comes to aviation (and many other subjects besides), has supported me for most of the years I have been published. During the most critical design stage when the success of a new picture is most likely decided we have long conversations, he as historian and me as a self-indulgent artist. His knowledge is so broad he even advised me on prehistoric crustaceans when they were mentioned in the foreword of my Aviation Sketchbook. While I have this opportunity I would also like to thank Justin Crowe who has helped tremendously with those recent paintings depicting armour. I can't imagine how I'd manage without friends like these and not only do they save me a colossal amount of time but they take the blame should there be a mistake in any of my pictures. I am most grateful to the collectors who buy my prints and keep my order book for originals filled with such a variety of subjects to paint. The next few months should include First World War, modern jets, trains, ships and of course many aviation and armour scenes from World War II. Well I am better at painting than I am writing so I'd best leave it there and get back to it.